Studies investigating motor skills have reported that knowledge of results, which is insight into how successfully the task was performed, can help with motor learning. Moreover, such studies have indicated the role of feedback as a motivational tool and revealed that learners desire to receive positive feedback after a “good” attempt at a task. We recently proposed the concept of a haptic-based perception-empathy biofeedback (BF) system, which provides real-time information on postural sway during training to the trainee and trainer for refining interpersonal feedback (Figure A). The BF works via vibrators on the trainee’s and trainer’s pelvic belts that are simultaneously activated corresponding to the trainee’s center of pressure position. This way of providing BF allowing the trainer to provide objective feedback and encouragement based on shared information. The first objective of this study was to examine the effect of this balance training regimen in healthy older adults performing a postural learning task. Second, we aimed to determine whether balance training with BF required high cognitive load to assess its feasibility in real-life settings. Twenty older adults were assigned to two groups: BF and control. Participants in both groups participated in a balance training session, where they were asked to perform a single-leg stance while minimizing postural sway. They were also asked to perform a secondary cognitive task of serial subtraction. We used this dual-task paradigm because recent studies have indicated that tactile BF can affect postural control during dual-task conditions and performance in the secondary cognitive tasks. This is probably because haptic BF requires participants to engage higher cognitive processes to process stimulus input. Testing comprised of postural sway measures (i.e., 95% confidence ellipse area and mean velocity of sway) assessed using a force plate and dual-task performance assessed as number of responses and correct answers. Measurements of postural sway revealed that sway area and mean sway velocity were significantly lower, indicating better balance performance, in the BF group compared to the control group during the training session. The BF group retained this improvement in sway area during the 24-hr retention test (Figure B). Results of the dual-task performance during the balance task were not different between groups (Figure C). Overall, our findings suggest that haptic-based perception-empathy biofeedback can modulate postural sway without interfering with cognitive task performance. They further suggest a potential benefit of the proposed balance training regimen in designing successful motor learning programs to improve balance and potentially prevent falls in older adults. Figure. An overview of the haptic-based perception-empathy biofeedback system: A) During balance training, vibrators on the trainee’s and trainer’s pelvic belts are simultaneously activated corresponding to the trainee’s CoP direction, allowing the trainer to provide appropriate feedback and encouragement based on shared information; B) Changes in body sway area during the balance task without BF, during BF, and 24hr-retention; C) Dual-task performance between the BF and control groups. 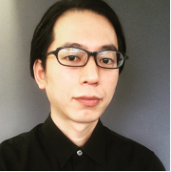 Kazuhiro Yasuda is a researcher at the Research Institute for Science and Engineering at the Waseda University Tokyo in Japan. His research focuses on the sensorimotor system in rehabilitation, including haptic-based biofeedback devices for gait and posture rehabilitation and immersive virtual reality system for unilateral spatial neglect. This research was supported by a Grant-in-Aid for Junior Researchers, Research Institute for Science and Engineering, Waseda University [Technological Research Section: 17C13]. © 2018 by the author. Except as otherwise noted, the ISPGR blog, including its text and figures, is licensed under a Creative Commons Attribution-ShareAlike 4.0 International License. To view a copy of this license, visit https://creativecommons.org/licenses/by-sa/4.0/legalcode. PreviousBreaking the ice: Could tendon vibration reduce freezing of gait in Parkinson’s disease? NextHow do older adults respond to unpredictable slips on a robotic platform?